1. Launch the Harmony Scan module and log in to the database using your Harmony Scan user name. The Database Selector dialog box opens, displaying the Environments available from the Harmony Stage database. 2. Select the Environment, Job and Scene in which you want to add elements. 3. Click on the Create Element button. 4. Click on the OK button to continue. The Harmony Scan module interface and the Create Element dialog box open. 5. In the Name field, type the new element’s name. 6. Enable the Vector option if the element is to be vectorized. 7. Choose the Bitmap Format of your element from the drop-down list. This drop-down menu is only available if you did not enable the Vector option. 8. 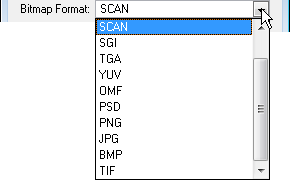 Select the Scan Type option from the drop-down menu. ‣ Colour: Select this option to create a colour bitmap element. ‣ Greyscale: Select this option to create a greyscale bitmap element. ‣ B&W: Select this to create a vector based element that is going to be painted using the Harmony Stage or Harmony Paint module. 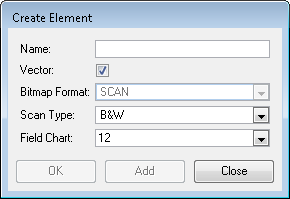 ‣ None: Select this option if you want to create an element that is not destined to be scanned, but that will be imported. 9. Select the field chart size of your element from the drop-down list. ‣ Click OK to add the element and return to the Database Selector. ‣ Click Add to add the element and keep the dialog box open to add more. ‣ Click Close to cancel and return to the Database Selector without adding an element.